I know most of you are familiar with Churros…The fried dough sticks rolled in cinnamon and sugar?! Honestly, they are probably my favorite dessert item and I won’t leave Disneyland with out hitting up the Churro cart. I love them so much I figured out an easy way to whip them up at home with some of my own special touches. Now when people come over for dinner I have this secret weapon that blows them away…and satisfies their dessert craving. I’m sharing the recipe with you today…Enjoy Friends! `In a saucepan melt the stick of butter and water. Bring to a simmer. `Sift in flour and 1 tsp vanilla beans. With a wooden spoon stir the flour and vanilla beans until the dough forms a ball. You want to sift the flour into the butter and water mixture so the flour is well incorporated. `Once the dough has formed a ball, turn off the heat. `You want to take the saucepan off the heat before you start whipping in the eggs. If you don’t take it off the heat you will end up with scrambled eggs. 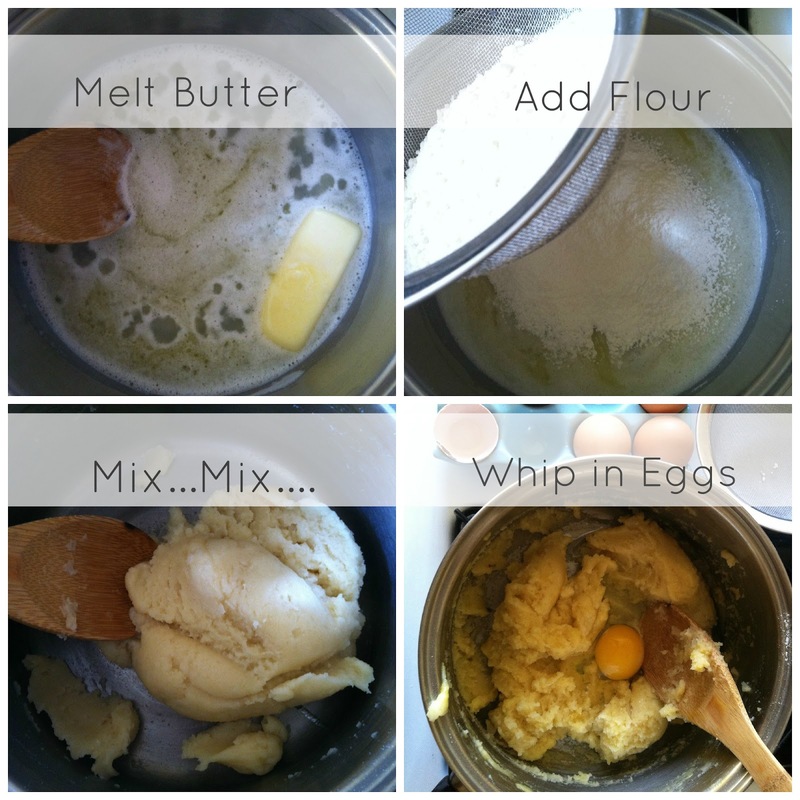 `Whip in the 3 eggs one at a time. Keep whipping the batter with the spoon until the dough becomes a glossy batter. Finish off the batter with 1 tsp of vanilla extract. `Fill a pastry bag with the Churro batter. `Mix the cinnamon, sugar and the last tsp of vanilla beans. You will finish your Churros by rolling in this mixture. `Heat your oil in a deep frying pan. You will want to have your oil at 350 degrees. `Once your oil is hot, pipe no more than 2 Churros into the oil. You want to only fry 2 at a time so the oil temperature stays hot. `The Churros will take almost 2 minutes to cook all the way through. Once they are golden brown let them rest on a paper towel. `Roll your Churros in the cinnamon, sugar and vanilla mixture. `Enjoy them warm with family and friends. Yum! What a great recipe! My husband will love these! My man loves them too! We dip them in melted chocolate! Jacqui’s done it again! These look amazing! Oh how I love churros! I’ve never thought to try making them from scratch. How delicious! Right?! Me either, at first. This is a very simple recipe and I love making them for parties or dinner guests. We like to serve them with melted chocolate or warm caramel for dipping. I have never made churros. I think I’ll try this recipe for our next family dinner using spelt flour. Thanks for sharing. I am so excited to have found this recipe. I love churros but never made them myself. This looks really good. When I was in Spain a long time ago, I enjoyed churros with chocolate. I feel like an idiot but the 2 tsp vanilla beans… What exactly is that? ?